Veteran CityVille players have been treated to a new feature this week - the Jail Museum. 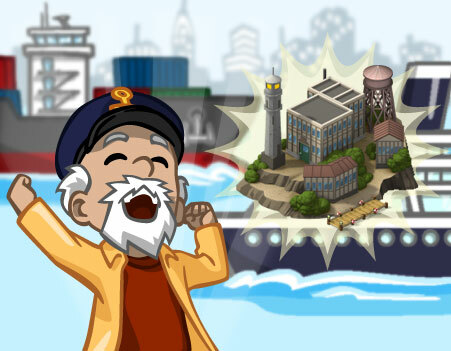 You'll need to be at least Level 70 to have access to this feature, which actually comes in the form of a new goal that will require you to expand your city's borders out into the water to reach an island prison, that has been turned into a museum. This of course come with a goal that you'll have 20 days to complete. Once you reach the water expansion that contains the Jail Museum, and can actually complete the entire goal, you'll receive the Jail Museum as your reward, with the item going into your inventory. You can then take it out and place it back where you found the placeholder in your city, or you can sell it for just 1,000 coins. Of course, this is your only chance at having a Jail Museum, so that's likely not the best choice. Again, this feature is only available for players level 70 or higher, but even though it comes with a time limit, it's likely that this is a permanent feature in the game. That is, once you reach Level 70 (if you're not there already), you will likely receive this goal and see the Jail Museum in your city the next time you login to the game. From there, the same 20 day time limit will apparently apply. We've reached out to Zynga for confirmation, and will let you know as soon as we hear back from them. What do you think of this Jail Museum in CityVille? Will you expand your land specifically to reach it? Let us know in the comments.